Mount Diablo has a large trail network and actually is at the core of an expansive web of "bikable" trails spanning almost from Walnut Creek in the west all the way to Round Valley and Los Vaqueros Reservoir in the east, if not beyond. However, bike-legal singletrack is not a big part of this picture at all. Within Mount Diablo State Park, the number of singletrack trails that are open to bikes can be counted on the fingers of one hand. With that in mind, this ride might be considered somewhat exceptional in that it manages to string together three bike-legal singletrack trail segments on Mount Diablo into a ride of reasonable length. It fails to avoid steep climbs while doing that, but that's par for the course in the East Bay. Those who dislike climbing need not apply. Plus, some of the climbs on the ride have such excessive slopes that they could be seen as worthwhile in their own right for being memorable experiences for that reason, though that would discourage me from repeating this ride often. 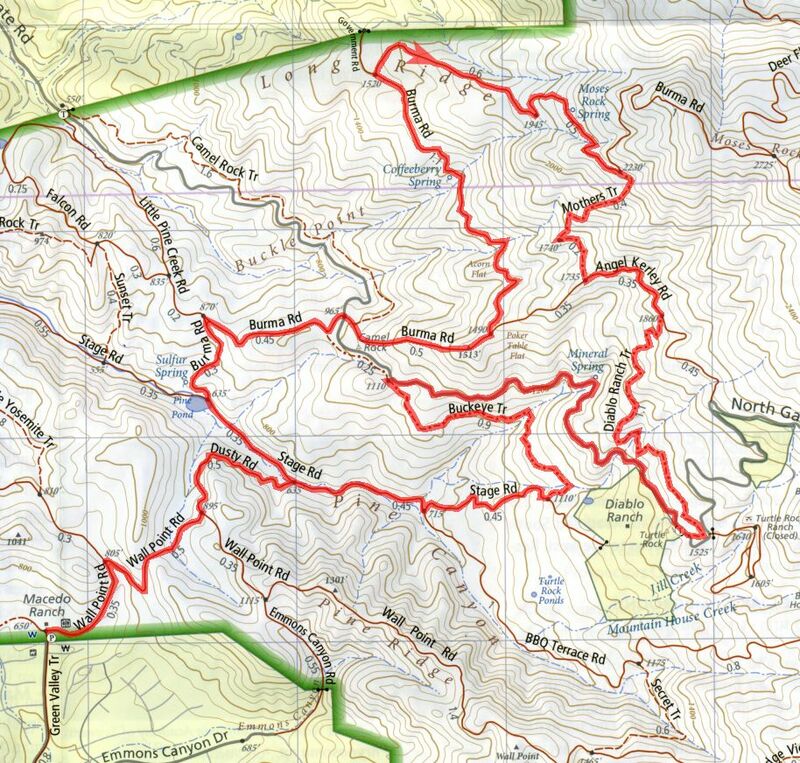 The ride starts from one of the minor trailheads of Mount Diablo State Park that is at the end of Green Valley Road near Danville, marked as "Macedo Ranch" on the park's map. This is a gated parking lot and its hours are 8:00 AM to sunset, meaning you won't be able to get in any earlier than 8:00 (which might be a desirable option during the summer in order to avoid the hotter part of the day). You'll also need to pay a fee to park here, by filling in a self-pay envelope. At the time I write this, this fee is $8. Seeing that the parking lot is surrounded by residential neighborhoods, you might expect to be able to find free street parking available not too far away. However, most of the nearby streets were lined with signs saying "Parking By Permit Only" as far as I could see. So, if you want free parking, you might have to look for it somewhere around Stone Valley Road and bike in from there, which will add at least a couple of miles to your overall ride. Other than the partial coverage you get on the half-mile stretch of the ride on Dusty Trail and a few creek-side clumps of trees over the rest of the ride, this route features almost no tree cover. Considering this part of the Bay Area can be among the hottest during a sunny summer day, this could be something to think about if you contemplate taking on the steep climbs of the ride in warm weather. You'll often be able to find the odd oak tree next to the trail in whose shade you could stop for a quick breather, but that's about it. On the flip side, during spring, when this hilly terrain is blanketed in green, the views especially from the higher elevations of the ride can look like scenes from a pastoral paradise. (Take a look at the photos to see what I mean.) Opting for the spring season to do the ride would be preferable also because it might allow for cooler weather. It doesn't end there. As soon as you turn onto the first singletrack on this ride, Mothers Trail, the trail starts descending very steeply. And then it keeps getting steeper from there. Inexperienced riders should beware. The trail surface is not technical, but its steepest part registered a grade of -35% on my GPS track. Once again, the fact that I have three data points that show up at this grade and that the other GPS track data I've found online also range between 32 and 41 percent for this spot are enough to make that 35% figure believable for me. That means that this trail easily wins the cup for the steepest singletrack on which I've ever set foot. This is so steep that, during the worst parts of the descent down this trail, coming to a full stop by braking is not a very realistic option, and the experience turns into a cross between riding and sliding. This is a bit too steep to be fun in my book; though, admittedly, it does bring with it its own kind of adrenaline rush. It's actually a shame that you can pay attention to little else over a good portion of the descent down Mothers Trail, because you're faced with some of the most panoramic views of the entire ride opening up widely in front of you as you descend this particular trail. The last notable trail on this route is Stage Road. The quarter mile or so of Stage Road that you cover in the early part of the ride happens to include the part of this trail where it merges with the adjoining creek bed for a short distance. I'm not referring to anything like a creek crossing. The trail temporarily dissolves into the creek and the creek bed itself becomes the trail that you follow for a few hundred feet. It's a unique trail feature that is sure to be enjoyed by riders who appreciate "water features" on biking trails. Naturally, we're not talking about a craggy creek bed or a lot of rushing water here; it's flat and shallow. Although, I imagine that there must be a time of the year when there's a more substantial amount of water in the creek. Speaking of creeks, if you're the kind of mountain biker who enjoys crossing creeks on your bike, if you follow Stage Road for another couple of miles instead of turning onto Burma Road where this route does, you'll be encountering 11 more such crossings. You can add to that another two crossings if you start on Stage Road further uphill from where this ride does. It could be possible to have fun with these by adding a long spur to this ride that continues down Stage Road before returning the same way, or you can leave those for another ride.